Live Life Like a Best Seller: Catan - Meet Serbia. Settlers of Catan That is. Oh the wonders of modern technology! While we use our little, silver ipad to check email and Facebook and Skype with family and friends, we have also found another fabulous use for it. 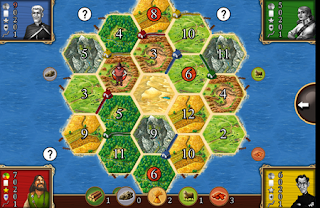 The Settlers of Catan ipad app, duh?! Do you know the game? It is (in my opinion)like the perfect marriage of Risk and Monopoly, but it isn't tedious and the board always changes so your strategy must change with it. I am not one for strategy, and Chris is; but I find that every so often I can still eek out a win (when I'm lucky). I am fiercely competitive though, so I am known to jump out of my seat, throw my hands in the air, and dance around when I manage to beat my strategic husband. When I cook at home, without fail, The Settlers of Catan come to dinner. The game just sort of shows up on the table without discussion or warning. We are nerds, it's fine. I find playing the game a better alternative to sitting in front of the TV. We recently introduced the game to Marko and Lela, and they loved it! Finally, we had new opponents, and Chris had a little more competition. Marko and Lela told their friends about the game, and the "Settlers" started making friends in Serbia. We were invited to hang out at Darko's house, so we arrived with the Settlers of Catan and our game faces. Slaga slaved away in the kitchen while Marko distributed drinks. Naturally, we started with a shot of Darko's apricot Rakia. Apricot is my favorite so far. The TV broadcasted a Serbian singing competition similar to American Idol, but traditional songs were performed rather than overplayed pop hits. Darko's cousin is one of the 34 contestants on this show, and she will hit the big stage in the next few weeks. I am sure that there will be more of these evenings to come as we cheer her on from our comfy couches. Darko was a great host and he kept trying to feed us more and more. All of the food (and rakia) was wonderful. No party is complete without little bit of Catan, so here we are teaching our new friends how to play the game. Marko and Lela helped translate when needed, and everyone seemed to enjoy the game. The evening was a jumble of Serbian, English and a singing competition playing in the background. At 2:30 a.m., Milan (on the far left) had won the game, and we said goodnight with promises of a rematch.